His Excellency the Governor John S. Duncan, OBE, Deputy Governor and Chairperson of the Queen Elizabeth II 90th Birthday planning committee, Mrs. V. Inez Archibald, CBE, members of the planning committee, Postmaster General Ms. Pascha Stoutt, Director of Culture, Mrs. Luce Hodge-Smith, public officers, ladies and gentlemen, members of the media, good afternoon. Over the last two weeks the Territory has participated in a series of commemorative activities to celebrate the 90th birthday of Her Majesty Queen Elizabeth II. I trust that when all the activities are over, we will package the information and have it presented to The Queen so that she sees how we have celebrated her legacy and her milestone — “BVI Style”. Today, we are unveiling the commemorative stamp issue not just because The Queen will be 90 years old tomorrow, but also to celebrate the fact that she has made history serving as the longest reigning monarch. Her Majesty Queen Elizabeth II is one of the persons I admire most in the world, mainly for her strength and her calm personality. I believe that one of the ways that we can engrave this celebration in the hallmarks of Virgin Islands history is through what we are doing right now. Stamps have a long history in the Virgin Islands as valued and respected emblems. Many of our golden citizens would tell you that stamps were once a vital part of our early methods of communication where letters were used as the main way of keeping in touch with family, friends and even to acquire pen-pals. In my early days while far afield, I remember that sending letters and greeting cards were a thrill. In fact, I would write page after page telling my parents and friends at home about how I was spending my days and nights at the university. Apart from stamps being a conduit for communications between persons living in different countries, they were those who collected stamps. I know of one student today who has inherited a stamp collection from her great aunt and former educator, Mrs. Enis Adams-Cushnie, who the Enis Adams Primary School was named after. Mrs. Adams-Cushnie was an avid stamp collector. She started her collection in the mid1970s and continued for approximately 30 years. Now the child, in whose care the stamps are now, will be able to continue this stamp collecting legacy. I know that there are many other families doing the same thing. Stamps are an educational and historical tool. I know that Dr. Giorgio Migliavacca of the BVI Philatelic Society would agree with me when I say that stamps are another way of learning about significant events, as well as exploring other cultures and people. I congratulate the BVI Philatelic Society for keeping this part of our history alive. Admittedly stamps are not used as often these days with the decline of postal letters and the increasing use of electronic mail. I know that we are living in a time where we have technology such as 123freegreetingcards.com, and other electronic greeting card sites that deliver greetings instantly. Handwritten notes have been replaced with text messages and emails. Traditional greeting cards have been replaced with e-cards on Facebook or delivered to our email addresses. We all know that gone are the days of pen-pals and telling scripted stories via our letters. But, I believe that we should rekindle that fire, teach our children so that they can appreciate our history and get involved with mailing letters and postcards. This is one way to develop a strong appreciation and passion for writing. So, today we are here with this commemorative stamp issue which includes four stamps, a souvenir sheet and a first day cover. All of the images used depict that of Her Majesty Queen Elizabeth II. 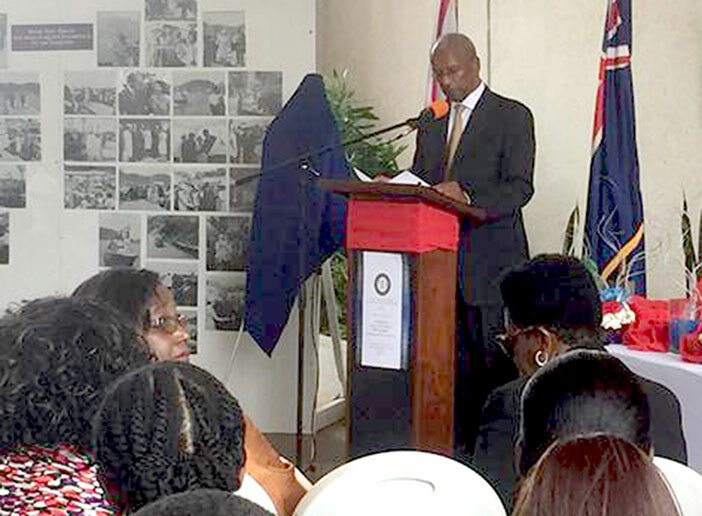 This event, like the others we have held so far, is a reminder of the monarchy’s role in linking the British Virgin Islands to the United Kingdom and the strength of this relationship. These links continue to be most evident constitutionally, culturally and historically. In a few moments the commemorative stamp issue for Her Majesty’s 90th birthday will be unveiled, and added to our impressive Stamp Room at the Old Governor’s House Museum. I look forward to what will be presented and I wish Her Majesty the Queen, the happiest of birthdays when it comes tomorrow, with many more to come.